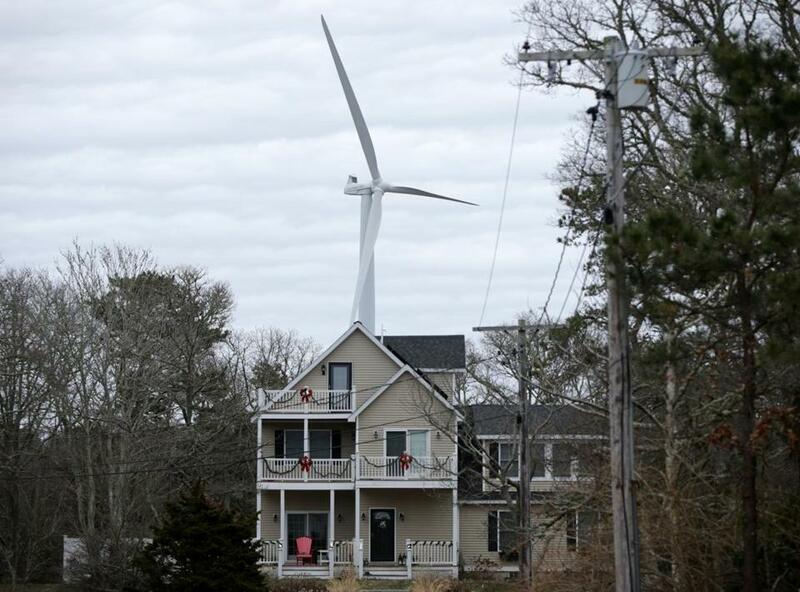 A wind turbine loomed over the Craggy Ridge neighborhood in West Falmouth. FALMOUTH — For nearly a decade, the giant blades have loomed over this seaside town, stirring hope and fear in the salty air. To proponents, the twin wind turbines proved that residents could act on their ideals, producing their own clean energy and relying less on fossil fuels. To critics, they were mechanical monstrosities, blinking eyesores whirring at such a frequency that some neighbors said they became ill.
Nine years after the first was built beside Falmouth’s waste treatment plant, both turbines now stand idle, no longer producing a kilowatt of electricity, totems of good intentions gone awry. Facing fierce neighborhood opposition and multiple lawsuits, selectmen last week voted to remove the turbines, which had cost the town about $10 million to build, saddling residents with years of debt. “All that’s left now is that we have an albatross to live with,” said Sam Peterson, the one dissenting vote on the five-person board. Wind power offers communities a way to reduce their emissions, but the protracted resistance to the turbines offers lessons as communities throughout the region consider similarly controversial renewable energy projects. It also reflects the challenges, often tacit, in the state’s promises to make substantial reductions in its emissions. Those plans rely on importing hydropower from Canada and major offshore wind farms, and both approaches are being contested by powerful, well-organized interest groups and could be subject to legal challenges. Dave Moriarty is an opponent of the town of Falmouth's wind turbines. The 56-year-old contractor, who lived close to the turbines after they were built, moved across town because they wrought too much stress, he said. He blames town officials for ignoring his and other neighbors’ concerns. In 2012, with both 1.65-megawatt turbines operating and the opposition becoming increasingly vocal, state environmental officials took the unprecedented action of recommending that one be shut down. They found that turbine, which was fewer than 1,500 feet from the nearest home, had repeatedly exceeded allowable noise levels. But a panel of independent scientists and doctors convened by the state Department of Environmental Protection found little to no evidence the turbines posed a health risk to neighbors. The town eventually stopped them from operating at night, and in 2015, a state appeals court judge ruled that the town lacked sufficient permits for one of the turbines and prohibited it from operating. Two years later, a Superior Court judge ruled that both turbines posed a nuisance to neighbors and ordered that they never operate again at their current location. 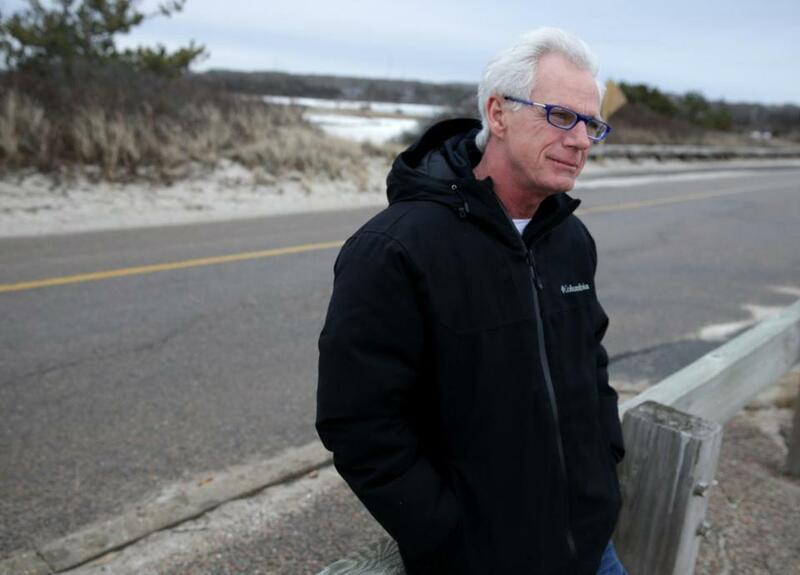 For Peterson, the only selectman who declined to vote in favor of removing the turbines, the decision ultimately reflects the power of those concerned about any large industrial project close to their homes. While he said he felt empathy for those whose homes are closest to the turbines, he thinks they exaggerated their complaints. He visited their homes and never heard more than a minor hissing of the moving blades. “We had the best of intentions, and they bullied those of us who tried to reason with them,” said Peterson, a retired physics teacher who like many of his neighbors hoped to do his share in addressing climate change. He also noted that the turbines were approved by repeated votes by more than 200 members of Falmouth’s Town Meeting. But he acknowledged that town officials made mistakes, particularly in failing to comply with zoning requirements. 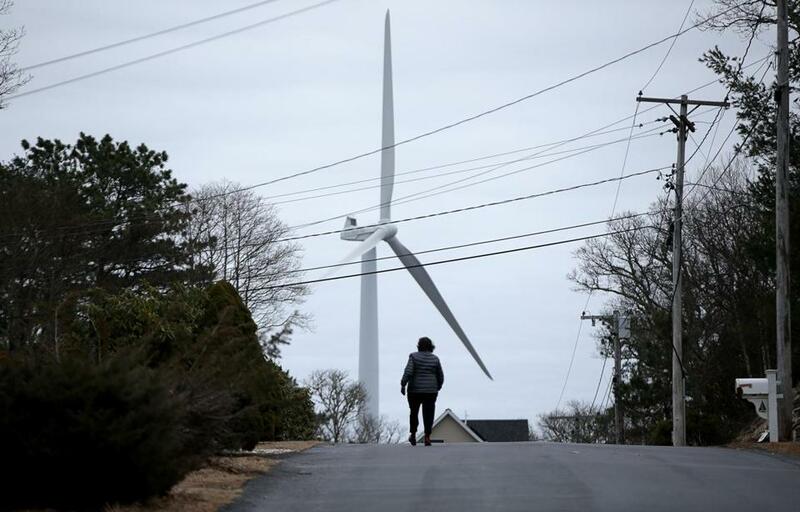 A woman walked along Westmoreland Drive in Falmouth, in the shadow of one of the city’s wind turbines. For other communities considering similar projects, he advised that they anticipate legal challenges by scrupulously complying with local bylaws and state rules and securing all the necessary permits. He suggested they do more to prepare residents for what to expect. And he said local officials should have a plan to deal with social media, where fears and resentments are often fanned in echo chambers. In addition to the $10 million that the town’s 30,000 residents spent on building the turbines, they now have to pay as much as $2 million more to remove them. Moran and other town officials acknowledge those losses will take a toll. They’re already considering cutting back on some services, such as curbside trash collection. While the town received $5 million in state loans for the project — $1.5 million of which has been forgiven — residents are likely to have repay the rest. If the turbines had operated as planned, functioning 24 hours a day, they were projected to earn the town between an estimated $1 million and $2 million a year. In an effort to recoup some of those costs, selectmen have instructed town officials to consider a variety of options for what to do with the turbines. Those include possibly converting them into cellphone towers or selling them to another community that might operate them. If they were able to negotiate such a deal with another town, Falmouth might have the rest of their state loans forgiven, as the turbines would be generating renewable energy. “We’re looking at our options, but either way, there’s certainly going to be a financial impact to Falmouth,” said Julian Suso, to town manager.